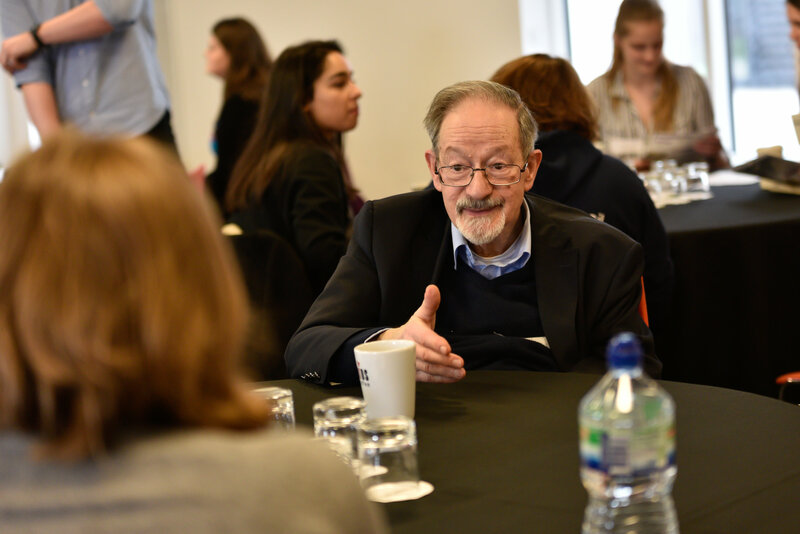 Members of the HMDT Youth programmes and HMD Youth Board have contributed questions to ask Dr Martin Stern MBE, a survivor of the Holocaust, about his experiences. This film resource can be screened at an activity to mark Holocaust Memorial Day to give other young people the opportunity to hear first-hand testimony from a survivor of the Holocaust. You can download a copy of this film here. Read about Martin Stern's experiences below. Martin Stern was born in 1938 in the Netherlands. His parents were German, but fled to the Netherlands in part because Nazi laws in Germany forbade his non-Jewish mother from marrying his Jewish father. When Martin was two years old, the Nazis invaded the Netherlands. His father could not continue his work as an architect and had to go into hiding. Martin’s mother died after giving birth to his sister and the non-Jewish couple who looked after him whilst his sister was born continued to do so for two years, pretending he was their son. One day, two men came into his school and asked if Martin Stern was there. His teacher understood that he was in danger and lied, saying that he was not in school that day. Unfortunately, Martin was too young to understand, so he identified himself and went with them. Martin later discovered that the man who had been looking after him for two years was sent to a concentration camp as punishment, where he was murdered. Two young men in civilian clothes unexpectedly walked in and one of them asked ‘Is Martin Stern here?’ And the teacher immediately shot back ‘No, he hasn’t come in today.’ And there I was. I didn’t understand what was going on. I put my hand up, and I said, ‘But I am here.’ And as these two young men were leading me out of the room, I looked back, and I’ll never forget the ashen face of the young teacher. Martin and his sister Erica were both sent to Westerbork transit camp. Martin was five and Erica was one. There, Martin watched people being forced into cattle trucks and sent away, until it was his turn. He remembers a train so crowded they had to stand for their journey, which lasted about two days and nights. They arrived in Theresienstadt, a concentration camp north of Prague. The conditions were appalling, with very little food and terrible hygiene; there was an outbreak of typhus spread by the lice. A Dutch woman, Mrs Cathariena De Jong, looked after Martin and his sister, even stealing food for them. She stood ready to board the train which would have taken them with the other children to their deaths, but their names were not called. On 8 May 1945, the Soviet army entered and liberated the camp, although it was some time before the prisoners could leave. After returning home to the Netherlands, Martin was sent from family to family, before moving to stay with relatives in the UK. He learnt English and did well at school, going on to become a British citizen aged 16 before studying Medicine at Oxford University. Martin worked as a hospital doctor living with his family in Leicester for many years. Today, he dedicates his time to sharing his story with groups across the UK, also teaching about other genocides and what it is about the human mind which makes such horrors possible. He often thinks about the other young children who were his friends in the camps, who did not survive. If you're interested in opportunities like this, you can sign up to the HMDT Youth programmes here.